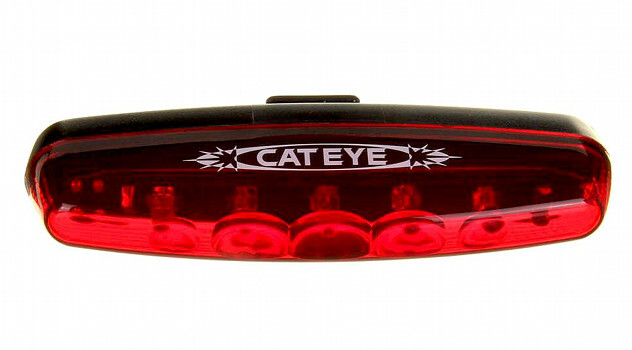 The Cateye TL-LD600 is a distinctive rear light consisting of a single strip of five low power LEDs. An older design, they’re still a common sight all over the country. Although Cateye have produced a replacement in the LD610, you can still buy the older version of the light for a song. Currently Wiggle have it on a 17% discount, while Chain-Reaction are doing 12% off. I’ve been commuting using dynamo lights for some time now, but my LD600 is still doing sterling service as an extra rear LED on my Carry Freedom trailer. Since I’ve often lent the trailer out, I’ve been able to check its performance in different circumstances, and it’s still a very effective rear light. The Cateye TL-LD600 is not a clip-on style light – you must use one of the Cateye mounts (although you can get hold of a belt clip adapter mount if you want to use it this way). Rather than a nice jubilee-clip style mount, the Cateye TL-LD600 has a more primitive fixed-size band, tightened by a small metal screw. (Depending on packaging, you may find that the TL-LD600 comes with one of Cateye’s newer flex tight brackets – a step in the right direction). Because the light is a long strip, it’s quite easy to use zip-ties or rubber o-rings in a figure of eight to clamp it onto any tube or flat surface (this is how I’ve fitted mine to the Carry Freedom – no risk of loss or theft). The long strip format does work against the TL-LD600 however, in that you can’t really mount it on a seat stay (it goes into the spokes) or vertically (it’s too long and hits the seatpost or seat stay – forcing you to point it at a crazy angle). The “chasing” LED mode is particularly weak – why would you reduce your light to just 20% brightness *and* let it flash? Crikey! The LEDs are not ‘power LEDs’ (as found on, say, the Smart Superflash and similar lights). Visibility is OK from behind but the light doesn’t excel at off-axis visibility – another area in which it shows its age a little. One advantage of not being an insanely bright mega flasher is that it’s much less unpleasant to ride or drive behind someone using it. Making it unpleasant for people to drive behind can definitely encourage them into a rushed overtake. As a driver, I can vouch that sitting at light behind someone with a mega LED flasher definitely focuses my mind on getting past! The TL-LD600 definitely doesn’t have that problem. Few will want to buck the trend and deliberately opt for a less dazzling light, but it’s certainly an option. Because the Cateye TL-LD600 hasn’t passed the relevant tests it isn’t road legal when used on its own (in any mode). The Cateye TL-LD600 has a small rear button to one side of the case. One nice touch is that the light is switched on and off with a long press, so you can cycle through modes while riding without going dark. Unfortunately there’s only really one mode worth using.. The Cateye TL-LD600 runs on two AAA batteries. I seem to get much more than the stated battery life (15h steady, 30h flashing) but neither is much to write home about. Remember that the temperature at which you use the light and the type of battery used both influence that figure. The Cateye TL-LD600 has solid weather sealing (based on all weather mileage on the back of my trailer, 6″ from the tarmac!). The Cateye TL-LD600 rear LED light is an older design that’s clearly long in the teeth in some respects, especially battery life vs output. It is not offensively bright, which is a great advantage if you are a social rider and especially if you don’t subscribe to the simplistic “more watts = more safety” bandwagon. It is reliable and easy to operate. The light is let down slightly by the awkwardness of mounting it, but at the same time the width of the TL-LD600 can make it more prominent than a single point source (and more useful for drivers trying to fix your position). There are probably better options, but it’s certainly not one to avoid. Again, Wiggle currently have it on a 17% discount, while Chain-Reaction are doing 12% off.